Guiding Change Journeys, a title in The Practicing Organization Development Series, takes you on a cross-cultural odyssey of personal and organization transformation. Inspired by science, mythology, and real-life lessons, this hands-on resource offers eight compelling transformation cycles that will help you connect with the universal creative spirit within and around us. Each of the change cycles focuses on a specific practice in global organization development (OD) and gives you the insights and methods to guide transformation through uncharted territory. By applying the book's eight practices--awakening, pathfinding, adventuring, dancing with dragons, compassion, epiphany, synergy, and community--you can effect powerful change. Author Rebecca Chan Allen tells stories of change leaders and facilitators, confronted by business volatility and organization diversity, who use timeless techniques to transform impasse into innovation and conflicts into creativity. Guiding Change Journeys invites you to embrace the unknown and venture into new territory with clarity and confidence. 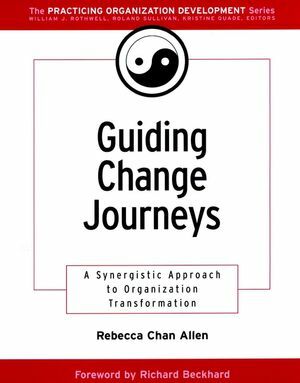 "Rebecca Chan Allen has created an exciting road map for a journey of change. Her landscape is complete with dragons, deep pits, and pathfinders to stimulate both the guide and the process of organization change." Rebecca Chan Allen, president of Delta Learning Organization, is a facilitator in cultural synergy and creative transformation. Her clients include HRD Canada, Imperial Oil, ScotiaBank, Amoco, Exxon, Shell, CP Rail, AEC International, Nortel, PanCanadian, YWCA, and others.